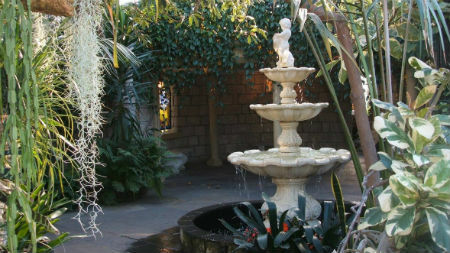 A botanic garden with a tropical house with a carp pond and waterfalls, formal gardens and a cafe. Opened in 1993 by Prince Edward, Inverness Botanic Gardens, formerly known as the Floral Hall and Gardens, are an oasis of calm and beauty within walking distance of the bustling city centre. With each new season the gardens are an explosion of colour and texture with borders planted to demonstrate a wide variety of plants and growing conditions. The impressive glasshouses reveal the drama of plant diversity ranging from the tropical rainforests to arid, heat scorched desert. In the Tropical House which mimics the hot, humid tropical regions of the world, the plantings are a mixture of the familiar and the spectacular. Some of our most popular house plants derive from the rainforests and can be seen growing alongside important economic crops such as coffee. A waterfall cascades into a pond filled with friendly Koi carp, surrounded by showy tender plants such as bougainvillea, bird of paradise plants and orchids. In the adjoining cactus house, the amazing sculptural shapes of hundreds of species of cacti are planted among 75 tonnes of rock and it is a stunning reminder of the beauty of these plants which survive in the harshest of environments. Locally raised plants, many of which are cultivated by our gardeners and demonstrated in the gardens and glasshouses are available to buy from our sales area at great prices. The Inverness Botanic Gardens makes a wonderful year round destination, so come and revel in these beautiful and much loved gardens.